A Tennessee woman says she can live with the cockroaches crawling all over her rental home. But it’s the blood, foul odor, bullet holes and knife marks that make Jen Selph-Byars want to break her lease. It turns out the house was the scene of a gruesome murder two months ago, according to a report from WREG-TV News Channel 3 in Memphis. A man allegedly killed his roommate at the East Memphis dwelling, then butchered his body. 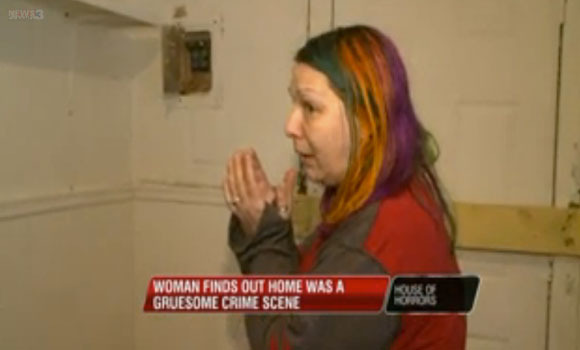 According to the TV station, Selph-Byars didn’t inspect the house before she signed a lease — just looked in the windows. But after she moved in, Selph-Byars found blood on the walls and around the vents, and even belongings of the victim and murder suspect in kitchen drawers. The hapless tenant then tried to get out of her lease. But landlords in East Memphis aren’t obligated to reveal a property’s history, attorney Michael Working told WREG. Isom said he’ll paint again. Which is bad news for Selph-Byars, who might have gotten out of her lease on this crime scene if the landlord refused to make repairs she requested in writing, Working said. Personally inspect any property you want to lease. And, if murder-most-foul is a deal-breaker, then research the property’s history before signing anything. Police, at least in East Memphis, will print out a crime history of a property for about 50 cents a page, Working said.